Richard Carpenter has always had an appreciation, deep respect, and interest in the natural world. Capturing it on film from his earliest experiences taught him photography, the physics of light and chemistry of color. It served to inspire his curiosity about the world in which he lived. Having some natural ability, he worked to capture the world about him in his own language, i.e., "mark-making", the language of visual artists. However strong these first inclinations were, they didn't serve to direct his early career to one as an artist. It would take several more decades, establishing a family and career and many other pursuits before returning to his earliest experiences in art -- where he now likes to "home." 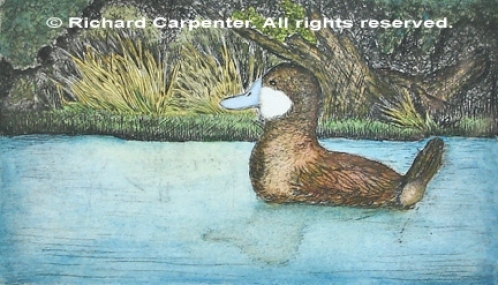 Carpenter lives and works in Northern Virginia and is self-taught on the computer and in much of his printmaking and painting techniques. As his interest in art grew, he took formal courses when time permitted, providing introductions to several artisitc media. 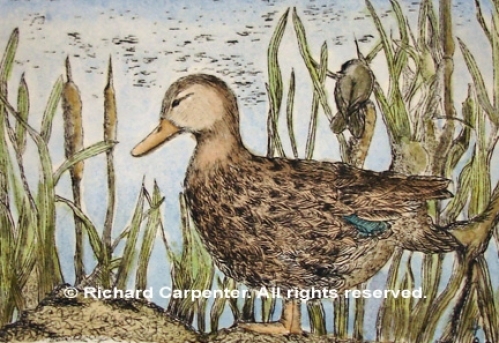 Most recently, Richard Carpenter's work has been shown in several venues in Northern Virginia as well as in the Atlantic Heritage Wildfowl Museum in Virginia Beach, Virginia.